One of the most pee-your-pants funny nights I’ve spent in a theatre occurred last summer in a dusty space at the Chicago Dankhaus. The New Colony’s Five Lesbians Eating a Quiche, which stole the show the prior year as part of Sketchbook X, was the pant-wetting culprit. This year, The New Colony took the play to FringeNYC, where it completely sold out the run and went on to win a “Best Overall Production” award from the Festival. And now, the little lesbian play that could will embark on an Off-Broadway run at New York’s SoHo Playhouse beginning October 13 and running through November 20. All my NYC peeps — I encourage you to check this fun production out, which features several of the original Chicago cast members. 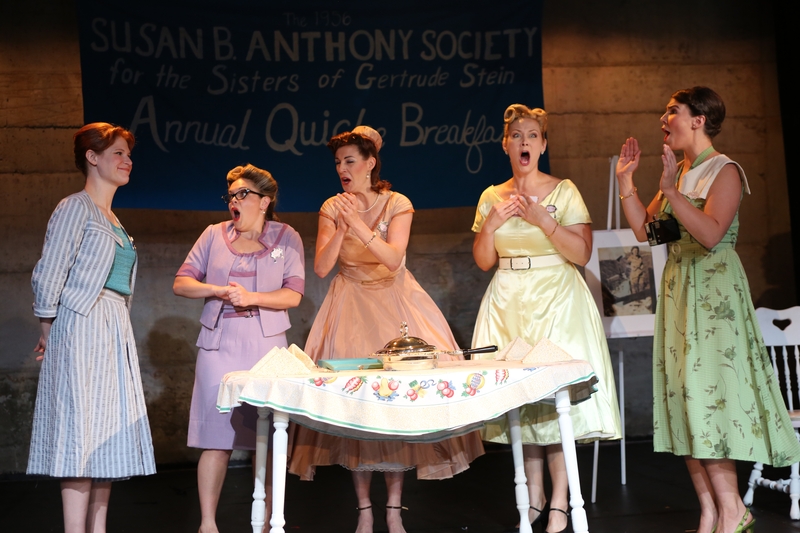 The cast of the Off-Broadway production of “Five Lesbians Eating a Quiche.” From left: Thea Lux, Caitlin Chuckta, Rachel Farmer, Meg Johns and Maari Suorsa. This sounds like a lot of fun! This is what I hate about living in Melbourne, it’s inconveniently far from New York.